Today I was blessed! 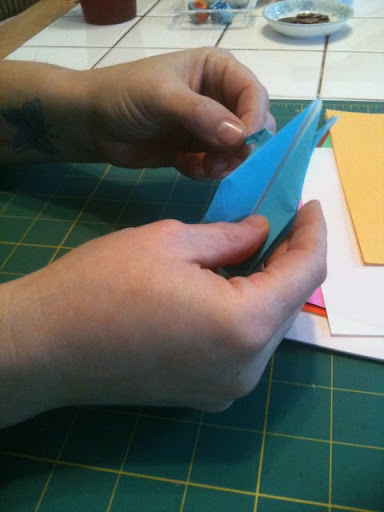 I was able to play driedle with a friend (she taught me - I'd never played before) and then she was kind enough to uncondisendingly show me how to make origami cranes. The reason this was so impressive is that a few years ago I folded well over 1,000 cranes for my mom as a mothers day gift - 3 months later she was diagnosed with her evil cancer. As she succumbed to her illness I did to mine too. After mom's passing I slipped into some deep depression and ED and apparently that stole the ability to fold cranes from me. I relearned and took step by step photos... And she coached and cheered, just what I needed today! A day I knew I had a rough therapy session ahead of me and a no doubt stressful doc appointment tomorrow. For a couple (of all too quick hours) I headed out a lot happier than I have been in a bit! And while I am singing her kudos (not saying her name in case she prefers I not) this is my same friend who gave me 24/7 access to call her when I was in a bad place! This is what Martha would call a good thing! Yay! I had a great time with you today, thank you for playing with me.